Managing your own business is certainly one of the most rewarding things you can do, and when you have it running like a ship on a clear glass ocean it can feel like you have reached the pinnacle. It’s not uncommon at this point for you to disrupt that calm with expanding your business to include one or maybe even two more parks. After all, you’ve done it once before and you know you can do it again. Moving on from your core business can take many forms – you might decide to take over a new park in a new location and leave your existing one. Or buy and takeover a competitor, or even start on the journey of owning multiple parks. They may seem like no-brainers but trust me, they can fall through the gaps if not focused on. Before you buy a business or takeover the managing of one, you probably have a good idea of the reputation of the business. Whether that was through the comments on its social media accounts or through word of mouth, it was certainly through the information supplied by the previous owners or managers. Another important element of my checklist, is getting right into the feedback and gaining a deeper understanding of where the business is sitting – both from an internal perspective with the staff and with the guests that come to stay. Your repeat guests are a great source of information and are usually very happy to tell you what they think about the business. Part of a takeover is wanting to make it succeed beyond where it is when you come on board, and the success of that hinges on factors like guest feedback as much as it does on improving the bottom line. The next highlight I focus on is the team members that come with the business. It is completely natural for them to feel out of place and unsure of themselves, so taking each one of them aside as soon as you can is important. If your plan is to keep the team in place then make sure you utilise them in teaching you how the business runs – make notes on how they operate and let them guide you through the day-to-day operations. If your plan is to let the team go, or some of them go at least, then my recommendation is to keep this as vague as possible until your exact plan needs to be implemented. Waiting a few weeks after your management begins is wise, as there are usually several staff that will want to move on regardless after a business takeover – and you want to ensure that you have got as much information out of staff before any of them leave. If you’re anything like me, you will be excited by the takeover you are conducting and ready to jump right into the new business. You’ll be keen to meet everyone that works there and you’ll be just as thrilled to get in and start changing things. This recommended checkpoint is one where I tell you to stop. Just hold on for a minute and let the dust settle. There may well be processes and functions that are detrimental to the operation of the business running successfully. And there will be some that work perfectly fine as they are. In your first few weeks in the new business, you should be focusing on learning what is in the business rather than changing it. If you come in and change things right away, you risk alienating the team that exists there already, and potentially the guests that come and stay. If you take your time, you will set your new business up for the success you want it to be. 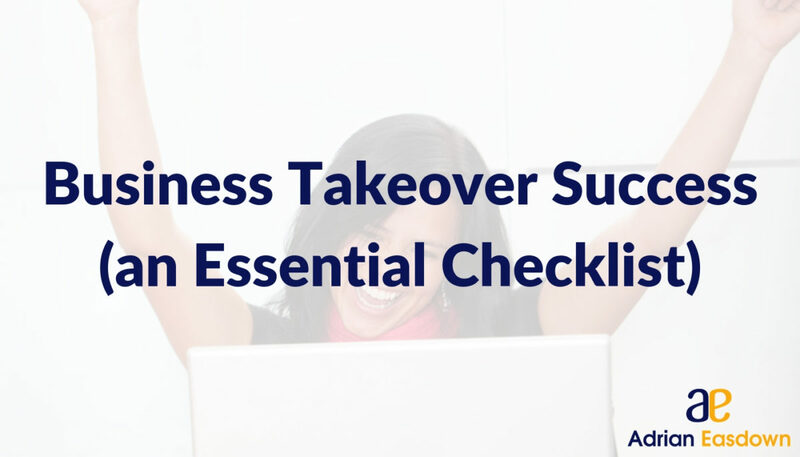 Taking over a new business is a lot of work and can be a highly stressful time, but by methodically moving through the steps needed and creating a checklist of items you will make sure your take-over is smooth and successful.